If you’re considering purchasing a home, you’ve probably realized that there are a lot of things to consider. This home fits your needs right now, but will it work for you five years from now? Are you okay with giving up on finding a home that has some qualities as long as it has the others that you’re looking for? Does its location provide you with easy access to all of the things that you do for fun? Each and every person who is looking at homes is looking for something a little different, but in today’s post, the expert Scottsdale mortgage brokers at Scout Mortgage have a bit of advice about what you can look for in the homes that you’re checking out. “But won’t I have an inspection done after I put in an offer?” you ask. That’s a great question, but there are a few things you can do before you even put in an offer to make sure that the home you’re considering should even still be an option for you. Keep reading to learn more! What Can You Look For On Your Own? As we mentioned above, an inspector will check out your home, but in many instances, this only happens after you’ve already put in an offer. If the inspector finds something that gives you pause, you have a good reason to back out. 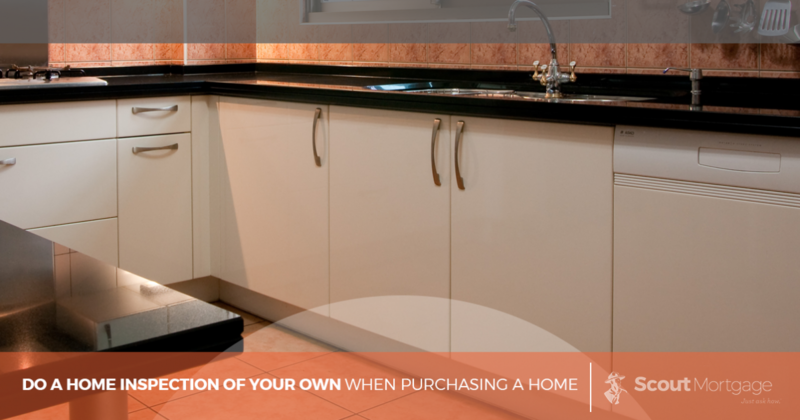 The truth, however, is that there are a few things you can do while your realtor is showing you around the home for the first time to make certain that it meets your most basic needs before you get further into the process. Your inspector will be looking for structural issues, electrical problems, landscaping red flags, and the like, but what can you be looking for on your own? In this day and age, plumbing is something that many of us take for granted. In many instances, how everything works doesn’t really cross our minds–until, of course, it’s not working the way it’s supposed to. You can avoid a huge headache in the future by doing a bit of work right now. If you find a home that you’re interested in, put the home’s plumbing to the test. You can do this by flushing the toilets in each room, turning on the faucets, and running the dishwasher if possible. This will ensure that everything is working the way it’s supposed to, because after all, there’s nothing worse than moving into a home only to find out that there’s a collapsed pipe outside that can’t handle water without backing up into the home. Older homes in particular will experience issues with tree roots growing through the pipes, so taking a look on your own can save you a big headache later on. It’s just a fact of life that at some point or another, your home is going to lose power. Whether that’s because of a storm that causes the power grid to go down, an accident with construction in your neighborhood, or something else entirely, it’s inevitable that something will happen. What’s likely to happen even more often is that some device that you use will cause the breaker to blow a fuse. Perhaps you’ll need to swap out some smoke detectors that are hardwired to your electrical panel. Maybe you’ll decide that it’s time to change out the ceiling fan for something more suited to your style. In those instances, you’ll need to use the electrical panel. “I’m not an expert, so why should it matter what the electrical panel looks like?” Trust us when we say that you’ll appreciate having an electrical panel that is well-labeled and ready to be used when it comes time for you to need it. Otherwise, you might end up in the garage flipping switches while someone upstairs checks for whether or not the light switches are working. We’re just getting started on sharing our tips and advice for what you can look for as a person who is interested in purchasing a new home. As we mentioned above, you’ll likely have an inspection done after putting in an offer, but there are some things that are good to know before you go to the trouble filling out paperwork only for everything to fall apart when the inspection doesn’t go well. Knowing what you’re getting into can make all the difference in the world, and the team of Scottsdale mortgage brokers at Scout Mortgage have plenty of experience in helping clients to make sure the financial aspect of the homebuying experience goes smoothly. Contact our team of mortgage consultants today to see how low of a mortgage rate we can get for you and be sure to stay tuned for part two in our blog series!